For breathtaking views, blue-green seas, white sand and G rated massages, be happy and head to Krabi. The province of Krabi is located along the Andaman Sea in southern Thailand. This area is famous for its stunning landscapes with limestone peaks jutting from both the land and sea. The beach town of Ao Nang is a good place to stay while exploring this area. From Ao Nang, visitors can take a long tail boat to visit Railay Beach, Phra Nang Beach, Phra Nang Cave, and several small picturesque islands on the Andaman Sea. The famous Phi Phi islands (where the movie “The Beach” was filmed) and Maya Bay can also be visited as a day trip from Ao Nang. 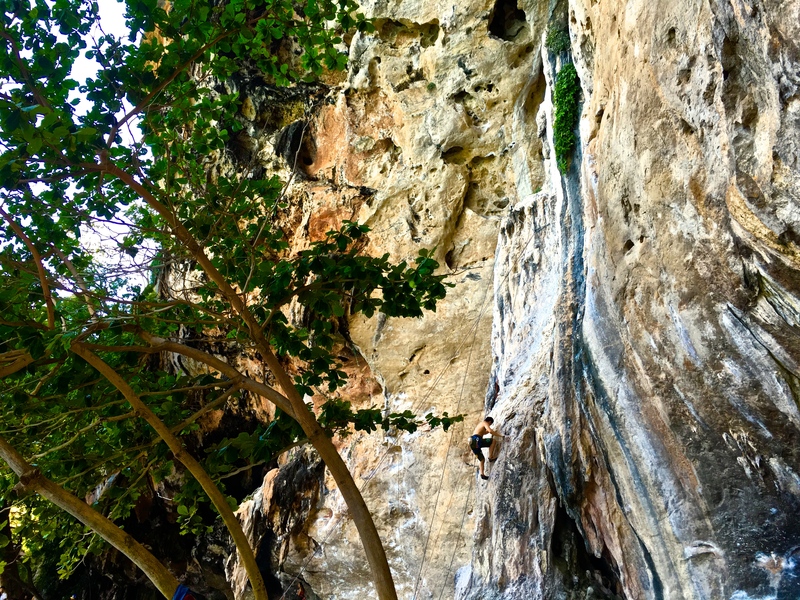 This area is also famous amongst rock climbers who come from around the world to climb at both Railay Beach and Ton Sai Beach. To the north of Krabi lies Phang Nga Bay (known for its James Bond filming location) and to the west is Phuket. The beach landscapes in Krabi, with stunning limestone mountains in the backdrop, make this scenic area of Thailand unforgettable. Ao nang has plenty of hotel and restaurant options which are all walking distance to Ao Nang beach (where you can get a long tail boat). Ao Nang pier (where the ferry to Phi Phi leaves from) is a short tuk tuk ride from the main strip of hotels in Ao Nang. 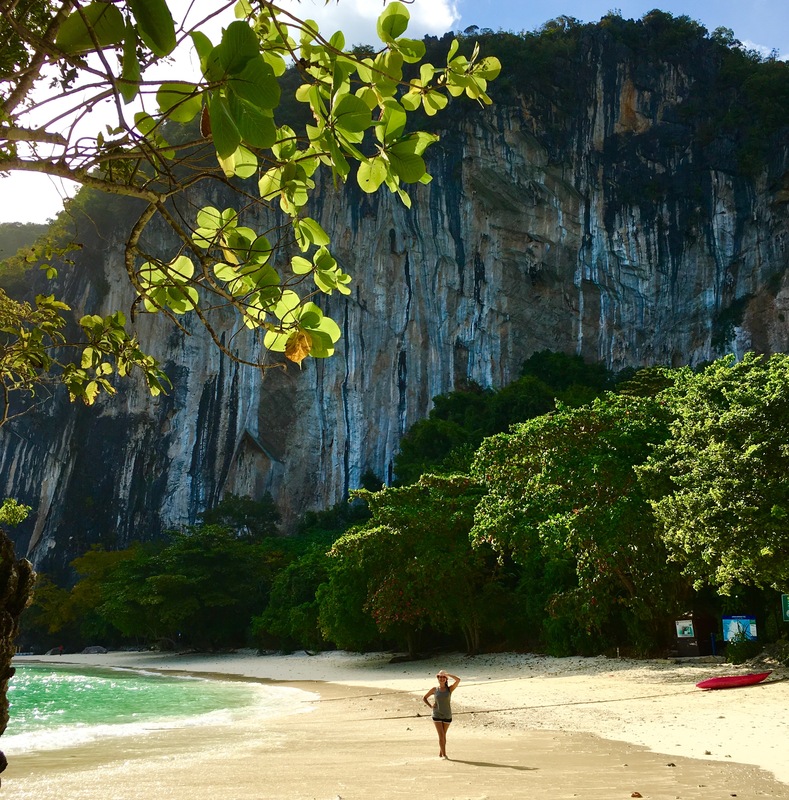 There are limited hotel options on Railay Beach and Phra Nang Beach, but remember that these beaches are only accessible by boat, which will limit your options for finding food at night, but gives you first access to the beach in the morning. Krabi has a airport (airport code: KBV) that is located 30 minutes from the beach town of Ao Nang. From Phuket airport (code HKT), Ao Nang is a 2 hour drive. From the airport, take a taxi or pre-arranged transport to your Ao Nang hotel. Travelers should consider staying in the town of Ao Nang as it has many hotel options, food options, and is a good base for further travel. This small Krabi beach town has a pier where speedboats can be rented, and it is from the Ao Nang pier that the ferry leaves for the Phi Phi Islands. At Ao Nang beach, a long tail boat can be arranged to visit Railay Beach, Phra Nang Beach, and Phra Nang Cave. The easiest way to get to Phi Phi Islands is by speedboat. The cheapest way to get to the Phi Phi Islands is by the ferry. If traveling by ferry, plan to stay overnight at Phi Phi. This way you will have ample time to rent a long tail boat to visit the islands and it’s many beautiful locations, including Maya Bay and Phi Ley Bay. Aside from visiting the Phi Phi Islands (about 90 minutes by ferry from Ao Nang Pier and 1 hour by speedboat), there are several other islands closer to Krabi that can be explored. 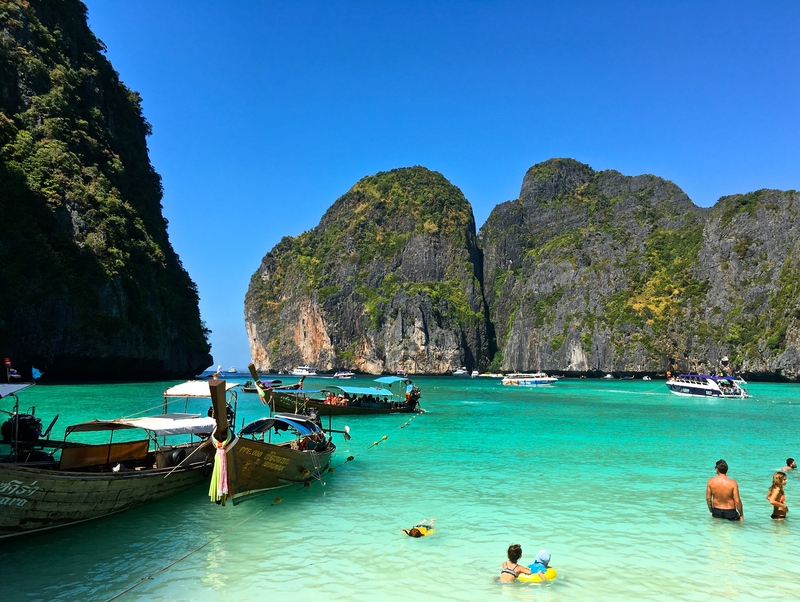 Koh Hong, Chicken Island, Koh Poda, Koh La Ding, and Koh Phak Bia (just to name a few) are stunning islands that are far less crowded than the Phi Phi Islands (Koh = Island). They are also closer to Ao Nang (20 minutes by speedboat, or 40 minutes by long tail). This part of Thailand is very hot. The high temperature is between 80-90 degrees Fahrenheit (25-30 degrees Celsius) year round. Wear a bathing suit and bring a change of clothes so you can easily get in and out of the water. Bring plenty of sunscreen and insect repellant while island hopping in Thailand. Re-apply often and generously. 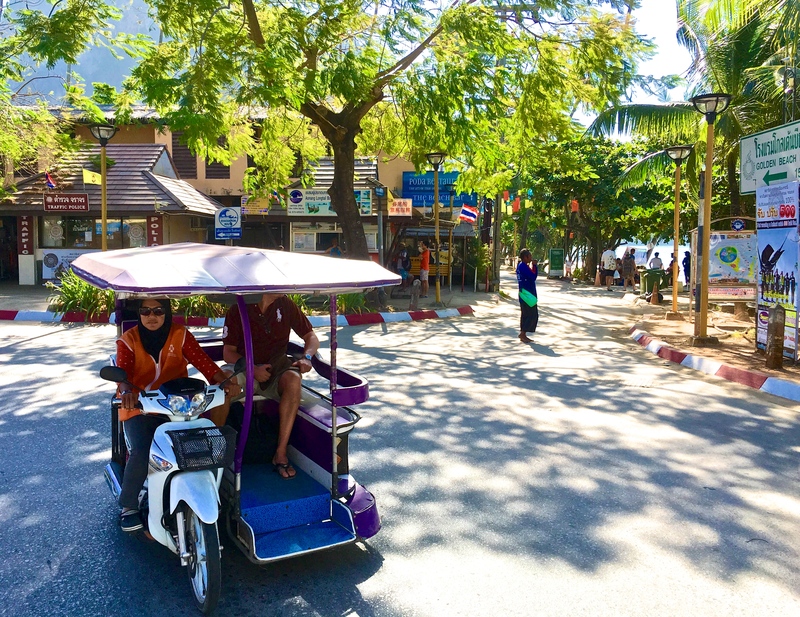 Bring plenty of cash to pay for tuk tuks, long tail boats, food, and park fees. Certain protected places (like Hong Island and Maya Bay) are national parks and have small fees that are collected on arrival. When spending time on these small islands, remember that if you didn’t bring it, it is unlikely to be there. So bring a towel, a sun umbrella, and snacks. Maya Bay has a small and limited snack bar, but Hong Island does not. Get up early to make the most of your day as the sun will set around 6 pm. While Thailand’s beaches are all very beautiful, there is nothing quite like the landscapes and backdrops in and around Krabi. Cheap flights to Bangkok can be found through local Asian carriers, and then you can fly to Krabi (airport code: KBV) from Bangkok (airport codes: BKK and DMK). If you are flying into Phuket (airport code: HKT) or staying in Phuket, Ao Nang is a 2 to 3 hour drive depending on traffic. It is best to arrange a driver ahead of time if you are planning to drive between Phuket and Krabi. To get to the Phi Phi Islands, you can take a ferry from the Ao Nang Pier or a speedboat. Speedboats are the fastest and most convenient way to get to Phi Phi and allow you the most freedom to explore the hidden parts of these islands. If taking the ferry, plan to spend at least one night in the Phi Phi Islands as the journey is longer. Some travelers may choose to travel from Phuket to Krabi via the Phi Phi Islands, as a ferry runs between these destinations. 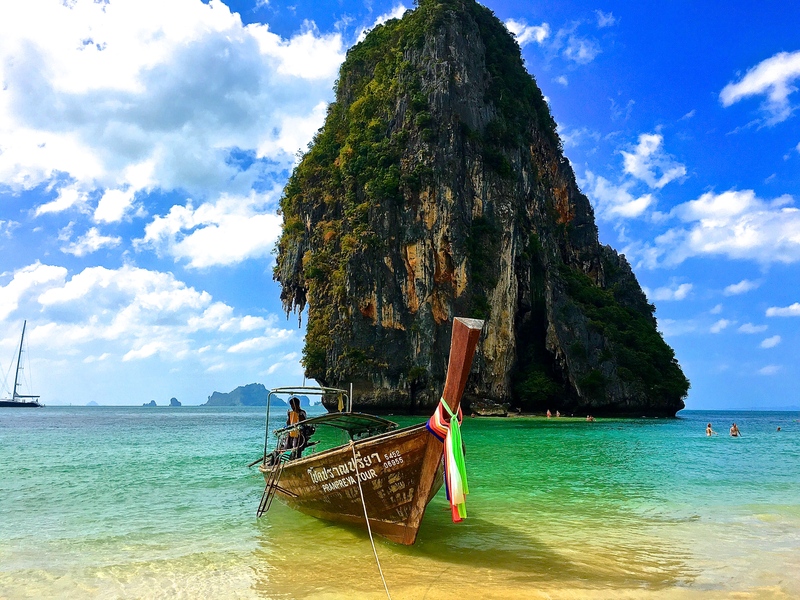 When visiting this area of southern Thailand, be sure to see Railay Beach, Phra Nang Cave, Maya Bay, and one of the many beautiful isolated islands (Koh Hong, Koh Lao La Ding, Koh Poda to name a few) in the Andaman Sea. 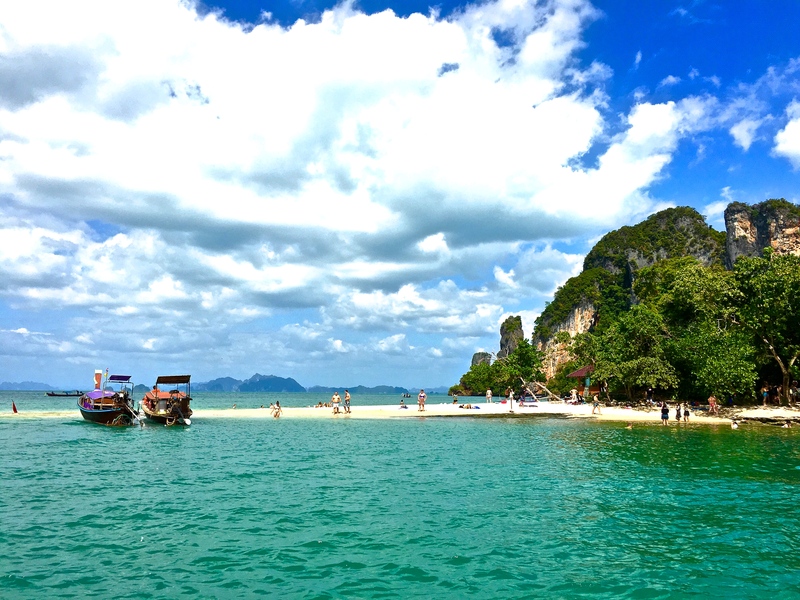 Rent a long tail or speedboat for the day from Krabi, and explore the tiny islands off the Krabi Coast. Phang Nga Bay is also famous for its gorgeous scenery and is about half way between Phuket and Krabi. Thrill seekers should book a rock climbing excursion ahead of time. Snorkeling is also a nice way to pass the time in this unique part of the world. Finally, end a long day of swimming with an affordable (5 to 10 USD for 60 minutes) Thai massage (the G rated kind). No need to book this ahead of time as there are several places on each street. Party-goers can find nightlife in nearby Phuket. While Krabi and Ao Nang have less of a party scene, the landscapes of Krabi are unbeatable.